Sri Ramakrishna, known as Gadadhar in his childhood, was born on February 17, 1836 at Kamarpukur about sixty miles from Calcutta. His parents, Khudiram (father) and Chandramani (mother), were pious and extremely religious, but they were financially poor making both ends meet with great difficulty. Khudiram, while away from home at Gaya, had a vision in which he was told by Lord Vishnu that he would be born to him as his son. Around same time, Chandramani saw a vision of light emanating from Shiva linga and entering her womb. She collapsed on the floor and realized later that she conceived. Gadadhar was liked by one and all in the village because of his sweet nature and talents in various fine arts. He, however, was not fond of a regular school because his keen intellect found out that the so-called education is only for earning money devoid of any real wisdom. He lost his father at the age of seven which made him more serious and in-drawn. He served monks who stopped at his village during their pilgrimage and listened with rapt attention to the discussions they often had among themselves over religious issues. As a child, he collapsed in ecstasy watching a line of white cranes fly by against the dark clouds in the background and also when acting as Lord Shiva on a stage in the village: a forerunner of what was to be seen later in his life. Meanwhile, the family’s financial position worsened everyday. Ramkumar, his elder brother, ran a Sanskrit school in Kolkata and also served as priest for some families there. He brought Gadadhar to Kolkata with him to study Sanskrit and to perform some priestly work so that he could make some money of his own. About this time, Rani Rashmoni, a rich woman of Kolkata, founded a temple at Dakshineswar, a few miles away from Kolkata of those days (now it is part of Kolkata). She approached Ramkumar to serve as a priest at the temple of Kali to which Ramkumar agreed. Thus he and Gadadhar came to stay at the Dakshineswar temple. Soon after that, Ramkumar passed away and Gadadhar then became the priest of the Kali temple there. When worshiping the deity Kali, he began to ask himself if he was worshiping a piece of stone or a living Goddess who could actually respond to his worship. Nagged day and night by this question, he began to pray to Kali – “Mother, you’ve been gracious to many devotees in the past and have revealed yourself to them. Why would you not reveal yourself to me? ” He would weep bitterly and sometimes even cry out loudly while worshiping. At night, he would go into a nearby jungle and spend the whole night praying. One day he was so impatient to see Mother Kali that he decided to end his life. He seized a sword hanging on the wall and was about to strike himself, when he saw light issuing from the deity in waves and was soon overwhelmed by those waves. He lost all external consciousness and experienced unspeakable Divine Bliss. This intense communion with God affected his daily priestly duties sometimes drawing the ire of the temple authorities. But they were soon convinced of his intense devotion and from then on Gadadhar came to be known as Sri Ramakrishna. Not content with this vision of Mother Kali, Sri Ramakrishna prayed to Her for more religious experiences. He wanted to know what spiritual practices other religious systems taught. Strangely enough, teachers of those systems came to him when necessary as if directed by some Divine dispensation, and what is more surprising, he reached the goals of those religious systems in no time. Bhairavi Brahmani, well versed in scriptures, helped Sri Ramakrishna to practice tantra and he attained success in all its disciplines. Three years later, a wandering monk named Totapuri arrived and guided Sri Ramakrishna to attain Nirvikalpa Samadhi, the highest spiritual experience mentioned in Vedanta. He remained in that state of non-dual existence for six months without the least awareness of even his own body. He also had experiences of Divine Bliss impersonating as Hanuman and Radha also – so much was his identification with these personalities that there were physiological and physical changes in his body during those moods. He married an exceptionally pure lady Sri Sarada Devi: he pointed to his family of her whereabouts in a nearby village without he and his family being aware that such a lady even existed. Together, they demonstrated a married life of unspeakable mutual love and co-operation that was totally untarnished by any carnal desire. They continued to live separately for some years after marriage: Sri Sarada Devi at her maternal home in Jayarambati while Sri Ramakrishna practicing intense spiritual disciplines at Dakshineshwar. Their lives were perfect examples of renunciation of all worldly attachments and the ego. 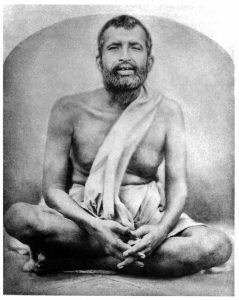 However, due to his intense spiritual practices rumors spread that Sri Ramakrishna became insane which troubled Sri Sarada Devi at her home very much. She came to Dakshineshwar to take care of him, but she was rest assured that her consort was not an ordinary person craving for worldly pleasures, but someone who was yearning for God. Sri Ramakrishna saw Sri Sarada Devi as Divine Mother incarnate and so much so that he actually worshiped her as such. Soon word spread about this remarkable man and people of all sections of society began to come to him at Dakshinehswar. He taught the basic truths of religion through simple parables, metaphors, songs and above all, by his own life. Laypersons interested in spirituality as well as monks visited his premises there to get benefit from his holy company with whom he shared his experiences and teachings freely. A group of young men also begun to come to him around this time and he paid special attention to them as he saw them as pure-minded burning with intense desire for God-realization. In last few days of his life, Sri Ramakrishna suffered with throat cancer, nevertheless he was still in Divine Bliss and shared the same with those who were around him. Despite the doctors’ and the disciples’ best efforts, Sri Ramakrishna breathed his last in an emaciated mortal frame on 16 August 1886. 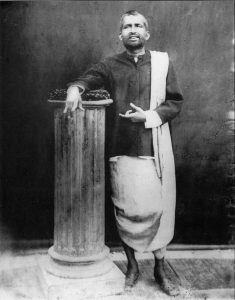 The young men, who were dear to Sri Ramakrishna and took up monasticism, later founded the Ramakrishna Order to spread the teachings of Sri Ramakrishna and rouse the humanity to take up the ideal of God-realization as the goal of human life. 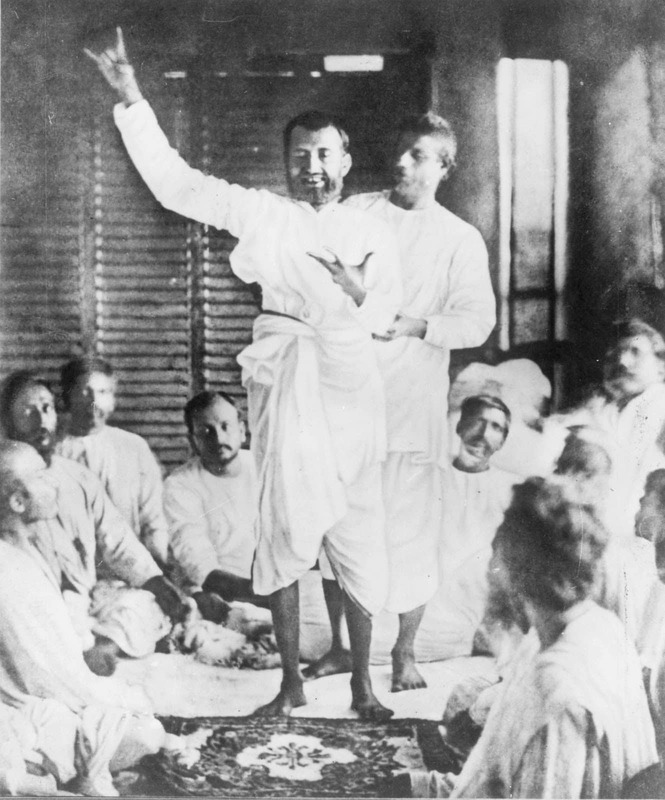 Ramakrishna taught no creed or dogma. His only concern was to make every person realize the infinite moral and spiritual potential in oneself. To develop that potential is a person’s foremost duty in life. He taught everyone to strive to develop that potential without wasting time over sense-pleasures or sectarian quarrels. Sincerity and faith would make a person realize this immense spiritual potential. No amount of book-learning or mere rituals/renunciation with no true devotion would be of any benefit. Religions are like so-many paths leading to the same goal, i.e., God. It does not matter how you call upon God, what rituals or books you follow, all one needs is only a sincere devotion to the ideal and to that alone. God is both personal and impersonal. For most people, it is difficult to conceive an impersonal God, so to begin with, God is to be thought of as a person; otherwise God is impersonal and beyond thought and speech. Be in the world but not of it. Perform your duties as well you can, but do not seek the fruits of your action. Try to feel as if you are only a tool in the hands of God. Religion is an experience. Religion makes no sense unless its truths are experienced. God is everywhere but He is most manifest in man. So serve man as God. That is same as worshiping God. 1775 Birth of Kshudiram, Sri Ramakrishna’s father. 1791 Birth of Chandra Devi, Sri Ramakrishna’s mother. 1805 Birth of Ramkumar, Sri Ramakrishna’s eldest brother. 1814 Kshudiram settles at Kamarpukur, Sri Ramakrishna’s birthplace. 1826 Birth of Rameshwar, Sri Ramakrishna’s elder brother. 1835 Kshudiram’s pilgrimage to Gaya. 1836 Birth of Sri Ramakrishna, known in boyhood as Gadadhar, February 18, about 5:15 a.m.
1845 Gadadhar’s sacred thread ceremony. 1856 Death of Ramkumar. Sri Ramakrishna’s first vision of Mother Kali as ocean of Light. 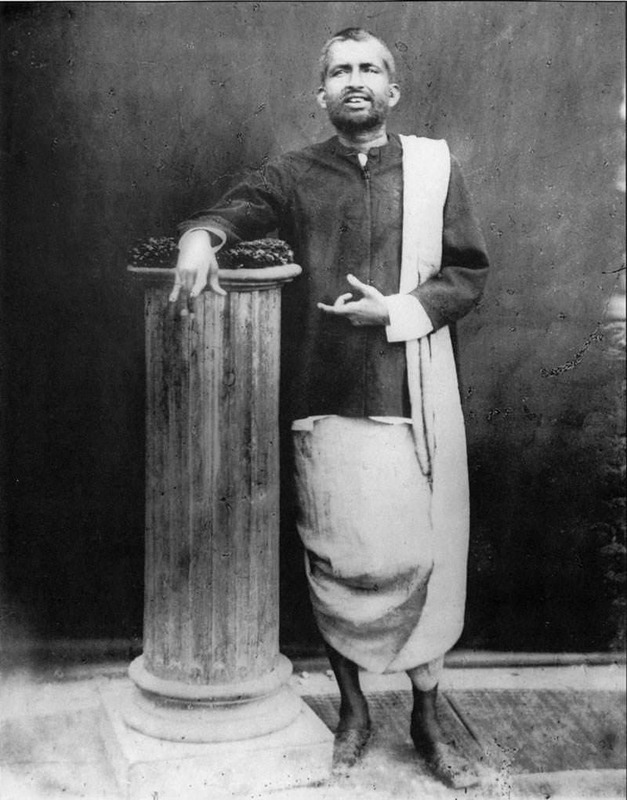 1858 Haladhari, Sri Ramakrishna’s cousin, appointed priest at Dakshineshwar. 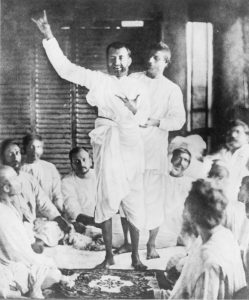 Sri Ramakrishna goes to Kamarpukur. 1859 Sri Ramakrishna’s marriage. Stays at Kamarpukur for 1½ years. 1860 Return to Dakshineshwar. Mathur’s vision of Sri Ramakrishna as Shiva and Kali. 1864 Sri Ramakrishna’s practice of vatsalya bhava under Jatadhari. Practice of madhur bhava. Initiation into sannyasa by Totapuri. 1865 Akshay, Sri Ramakrishna’s nephew, replaces Haladhari. Totapuri leaves Dakshineshwar. 1868 Pilgrimage with Mathur to Deoghar, Varanasi, Allahabad and Vrindaban. Meeting with Ganga Ma, a Vaishnava woman devotee. 1872 The Holy Mother’s first visit to Dakshineshwar. The Shodashi Puja. 1874 The Holy Mother’s second visit to Dakshineshwar. Sri Ramakrishna’s practice of Christianity, and vision of Christ. 1875 Sri Ramakrishna’s first visit to Keshab Chandra Sen.
1877 Death of Shambhu Mallick. The Holy Mother’s third visit to Dakshineshwar. Sri Ramakrishna’s last visit to Kamarpukur. 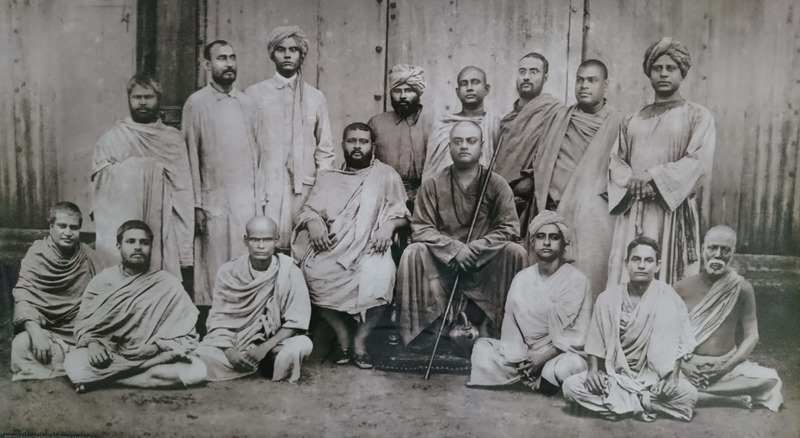 1884 Kalipada and Kaliprasad (later Swami Abhedananda) come to the Master. Death of Keshab. Meeting with Pundit Shashadhar. Gopal’s Ma and Nag Mahashay come. 1885 The Holy Mother comes to live at Dakshineswar for the last time. The “inner circle” of disciples becomes complete with the coming of Purna. Last visit to Panihati. Illness and removal to Shyampukur. Association with Dr. Sarkar. Removal to Cossipore.